The lumbar veins are veins running along the inside of the posterior abdominal wall. They are the lumbar equivalent of the posterior intercostal veins. They are four in number and accompany the four lumbar arteries, with the vein lying superior to the artery (the same arrangement as in the intercostal neurovascular bundles). The first and second lumbar veins usually join the ascending lumbar vein rather than the inferior vena cava, which then joins the subcostal vein of the same side to form the azygous vein on the right or hemiazygous vein on the left. The third and fourth lumbar veins on the left pass behind the abdominal aorta to reach the inferior vena cava and all lie behind the sympathetic trunks. 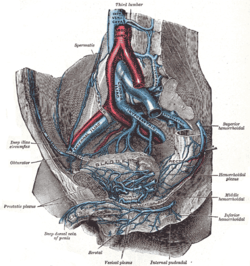 The iliolumbar veins join the common iliac veins. This page was last edited on 27 November 2018, at 14:54 (UTC).